David Tennant is the host of a brand new cutting edge Shakespeare-themed app rolling out onto Android devices from today. The app is the result of a joint venture between Samsung UK and the Royal Shakespeare Company and aims to inspire 11-18 year olds to study Shakespeare and unlock the works of the Bard for a new generation. The RE: Shakespeare programme is where amazing talent meets amazing technology and the world’s favourite playwright meets some of the biggest names in popular culture. 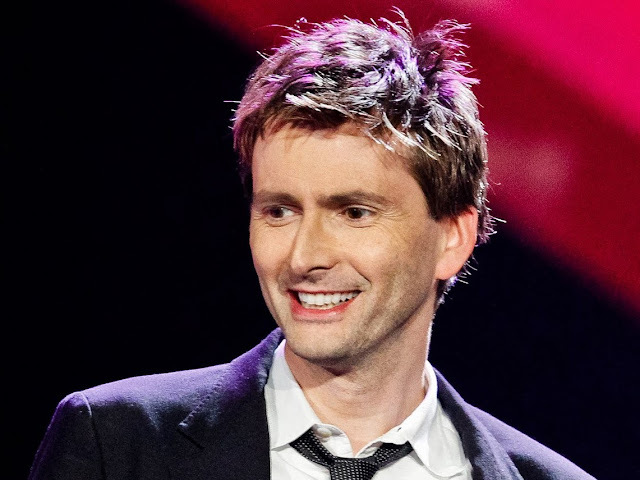 David Tennant has made the shortlist for Best Actor at the 2015 TV Choice Awards where he has been nominated for his role as the grumpy but lovable police detective Alec Hardy in ITV's drama Broadchurch. He will face some tough competition in the category as he goes head to head with James Nesbitt (The Missing), Aidan Turner (Poldark) and Peter Capaldi (Doctor Who). David's Broadchurch co star Olivia Colman has also been shortlisted in the Best Actress category and is up against Jenna Coleman (Doctor Who), Eleanor Tomlinson (Poldark) and Sheridan Smith (Cilla). The series itself is nominated for Best Drama against Last Tango In Halifax, Downton Abbey and The Musketeers. Also nominated for an award is the spoof documentary series W1A which is narrated by David and is up for an award in the Best Comedy section against Peter Kay's Car Share, Birds Of A Feather and Benidorm. Episode 6 of the US crime drama Gracepoint premieres tonight on Sky Atlantic in Germany and Austria. 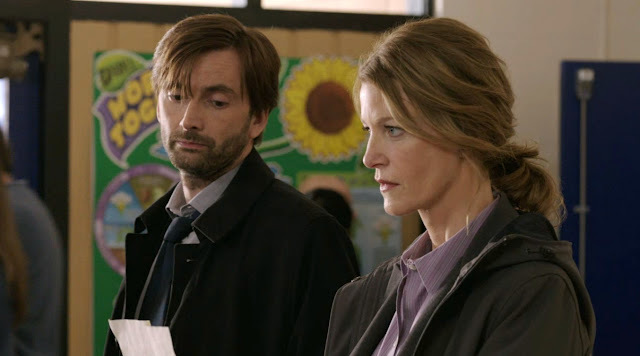 David Tennant and Anna Gunn star as Emmett Carver and Ellie Miller, two feuding detectives on the hunt for a child’s killer in a quiet Californian town. The series is an American remake by FOX TV of season one of the UK series Broadchurch. In tonight’s episode, Jack Reinholdt’s (Nick Nolte) shady past has been revealed in the press and now everyone believes he has Danny’s death on his conscience. Can Detective Carver calm the angry lynch mob? Watch Gracepoint Episode 6 – The Mob – from 21.00 on Sky Atlantic. There is a late night repeat at 03.00. Gracepoint Folge 6 - Die Meute In Gracepoint glaubt man mittlerweile, dass der alte Jack Reinholdt (Nick Nolte) den kleinen Danny auf dem Gewissen hat. Dem Außenseiter droht Lynchjustiz. Kann Detective Carver "Die Meute" beruhigen? The US crime drama Gracepoint reaches its halfway point today with the premiere of episode 5 on TNT Series across Latin America and The Caribbean. 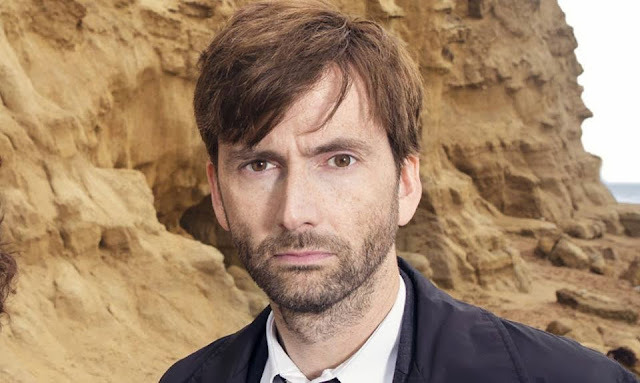 David Tennant stars as Detective Emmett Carver who together with his partner, Ellie Miller (Anna Gunn) is on the hunt for the killer of a young boy in a coastal Californian town. 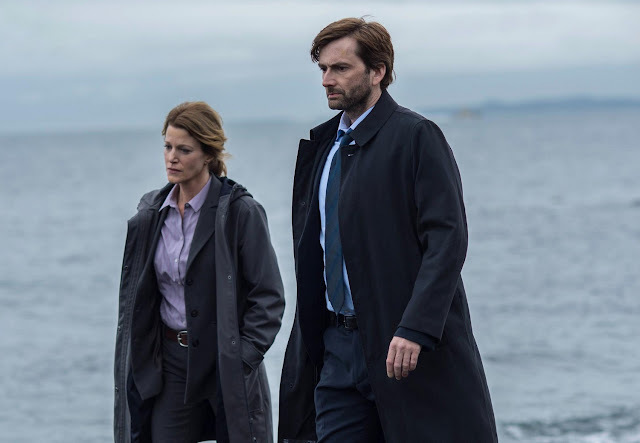 Gracepoint is the FOX TV remake of season one of the award-winning UK drama Broadchurch. The series also stars Nick Nolte, Jacki Weaver, Michael Peña and Virginia Kull. The second season of the award winning UK drama Broadchurch continues on TV2 in Denmark tonight. 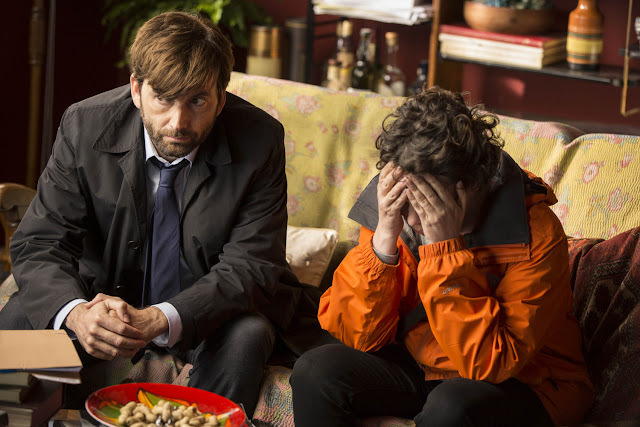 David Tennant and Olivia Colman return as Alec Hardy and Ellie Miller, as the detective duo set their sights on another unsolved murder case. Meanwhile the other residents of Broadchurch prepare for the trial of Danny Latimer's killer. Arthur Darvill, Eve Myles, Charlotte Rampling and Jodie Whittaker also star. In tonight's episode there's a shock twist in Joe's trial which affects all of the residents of Broadchurch. Hardy must face up to his past and he and Ellie set up a meeting between Lee and Claire. Meanwhile, Paul continues with his secret prison visits. Watch Broadchurch episode 2 tonight in Denmark on TV2 from 20.55. The rollout of New Who episodes of Doctor Who continues on TV in India this week with five new season three episodes making their debut on FX. David Tennant stars as the Doctor, an enigmatic time Lord travelling through time and space with his companion Martha Jones (Freema Agyeman). This week sees the pair face some of the Doctor's oldest enemies, race against time to save a doomed spaceship and face the consequences of toying with human DNA, while Martha is left isolated when the Doctor is forced to go into hiding from a deadly alien force. The new episodes premiere at 9pm each day with several repeats during the following 24 hours. All five new episodes will also be aired in marathon on Saturday 4th July from 1pm. Monday 29th June Episode 5: Evolution Of The Daleks The newly-created Dalek-human hybrid, and the other three members of the Cult of Skaro launch an attack on Hooverville, along with their Pig Slaves. Catch up with any of our blogs that you might have missed last week in the post below. Just click the link to read the article. Remember also that you can still read older articles via our archives. 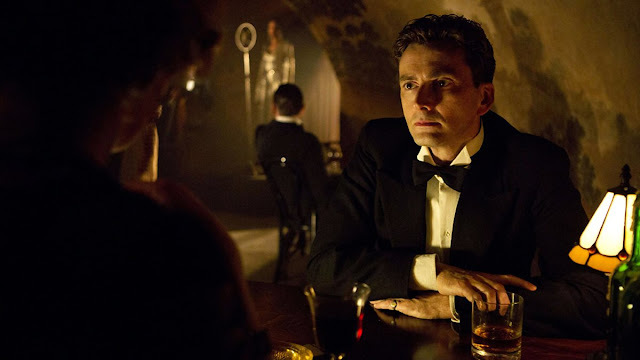 The concluding episode of the two part miniseries Spies Of Warsaw airs on DR1 in Denmark tonight from 23.20. David Tennant stars as French military attaché and spy Jean-François Mercier in the tense wartime thriller adapted from the novels of Alan Furst. In episode 2, Mercier manages to evade his Nazi captors and travels to Czechoslovakia to track down a German agent who might make him wiser about the Germans' intentions. The series also stars Janet Montgomery, Marcin Dorocinsky, Anton Lesser and Fenella Woolgar. Spioner i Warszawa (2:2) DR1 – 23:20 Marts 1938. Med livet som indsats forsøger den franske spion Jean-François Mercier at afsløre Nazitysklands krigsplaner. Det lykkes ham at undslippe sine tyske kidnappere, og nu sætter han kurs mod Tjekkoslovakiet for at opspore en dobbeltagent, der måske kan gøre ham klogere på tyskernes hensigter. Some very positive feedback has reached us following the Canadian gala premiere of the BBC Films comedy What We Did On Our Holiday last night thanks to reader Beth who emailed us to tell us about the event. 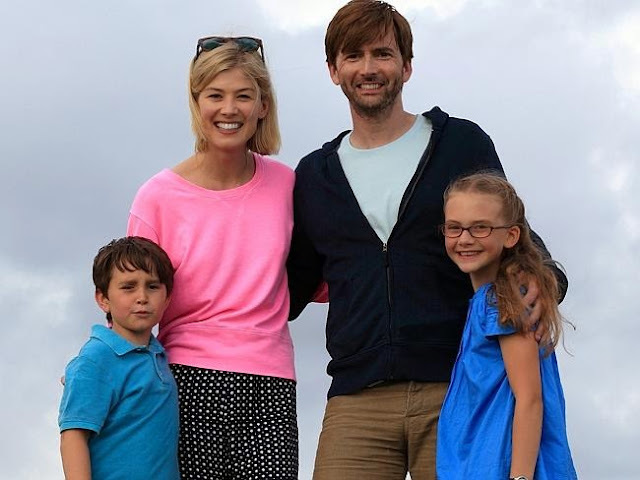 The semi-improvised black comedy What We Did On Our Holiday stars David Tennant and Rosamund Pike as Doug and Abi McLeod, a divorcing couple who take a fraught trip to Scotland with their three children to attend a birthday celebration for Doug's father Gordie (Billy Connolly). As Gordie is unwell, they want to keep their marriage difficulties quiet...if only the kids could keep a secret. Ben Miller, Amelia Bullmore and Celia Imrie also star in the movie which was written and directed by Guy Jenkin and Andy Hamilton. The screening took place at the Oakville Festivals of Film and Arts in Ontario, Canada last night and was followed by a Q&A with director Guy Jenkin. Beth told us, "I don't remember any other film prompting so much uproarious laughter." 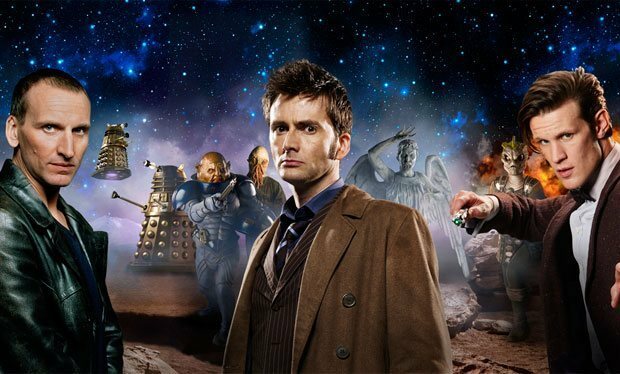 Disney XD will be running a marathon of episodes from season 2 of the revived series of Doctor Who next weekend. 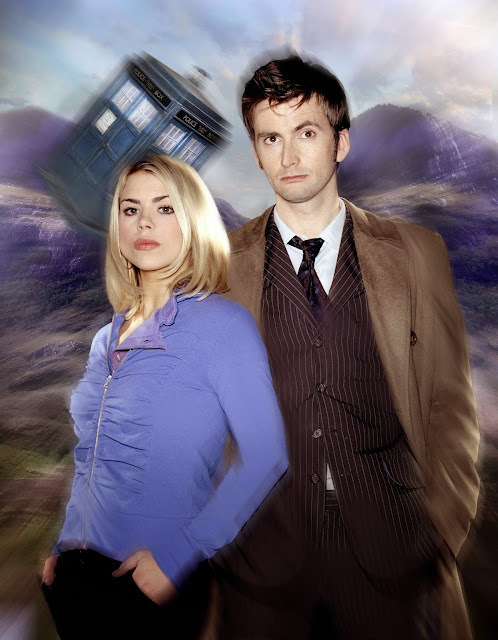 The ten episodes starring David Tennant as the Doctor and Billie Piper as companion Rose Tyler will be shown on Saturday 4th July from 12.00pm ET on both Disney XD and the Spanish language channel Disney XD en Español. 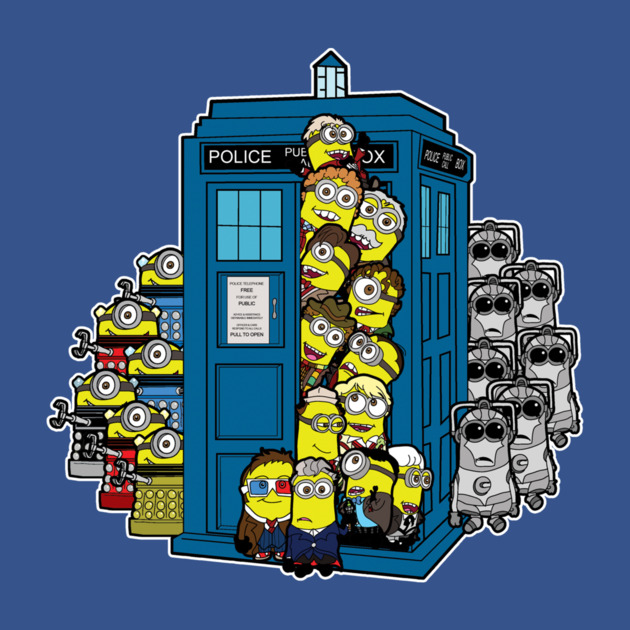 The channel, which is aimed at slightly older children than the traditional Disney Channel audience recently acquired David Tennant's seasons as the Doctor, so introducing a whole new generation of Americans to the character. If you can't spare ten hours on Saturday to watch all of the episodes, don't despair. The marathon will be repeated on Sunday 5th July from 9.30am while individual episodes continue to air regularly on the channel. Check our daily TV guide for details! Links to buy are under each design. They ship worldwide from the USA and there's a wide range of hoodies, tanks, kids sizes and posters also available!! 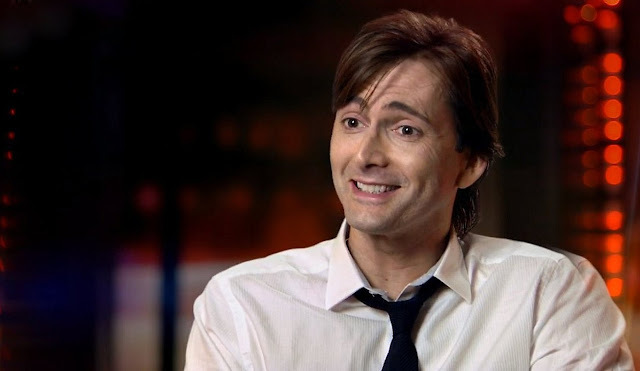 David Tennant is among the cast of the new season of Dreamwork's Dragons, Race To The Edge. The new thirteen episode series was released in its entirety exclusively on Netflix today. 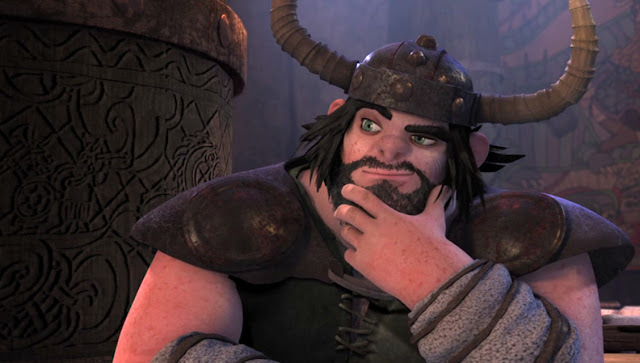 David voices the character of Spitelout, father to Snotlout in episode 3, Imperfect Harmony, where, as a member of the Council of Berk he attempts to veto the Riders' planned trip to investigate a new island. Hiccup and Toothless are back in an all-new action packed series DreamWorks Dragons: Race to the Edge. Their quest: to explore strange new worlds, seek out never-before-seen dragons and end the war between Vikings and dragons once and for all. The dragon riders discover a lush island that turns out to be the home of the Deathsong, a massive dragon that threatens to trap them forever. The Oakville Festivals of Film & Art (OFFA) will be hosting the Gala Eastern Canadian Premiere of What We Did On Our Holiday today at the Oakville Centre. The much acclaimed BBC Films comedy stars David Tennant, Rosamund Pike, Billy Connolly and Ben Miller and is due to be released in cinemas in Canada on 10th July. The premiere screening will include a Q&A with Guy Jenkin. The movie will also have a limited release in the USA on July 10th and will be made available as a digital download on the same day. The Oakland Festivals of Film & Art 2015 is a three-day festival running from 26th- 28th June in Oakland, Ontario. It features 17 feature films and documentaries, many more shorts and an exclusive Art Fête with live music, performances and photography from selected local and international talents. This year’s festival is hosted by veteran film critic and cinephile Rob Salem and by Film.Ca Cinemas. The heartwarming UK movie What We Did On Our Holiday is now available to buy in Australia on DVD and Blu-ray and as a digital download. David Tennant and Rosamund Pike star as feuding couple Doug and Abi McLeod with Billy Connolly as Gordie in the semi-improvised black comedy from Andy Hamilton and Guy Jenkin, the makers of the BBC sitcom Outnumbered. Doug and Abi are taking their three children on a trip to Scotland for a big family gathering. They are in the midst of a difficult divorce, and have asked the kids to keep it a secret from their extended family. But as the inevitable feuds kick in, a completely unexpected turn of events involving the children causes further tensions to rise to the surface. And with the repercussions that ensue - hilarious and emotional in equal measure - the family are forced to put aside their differences and work together or else risk losing what they hold most dear. 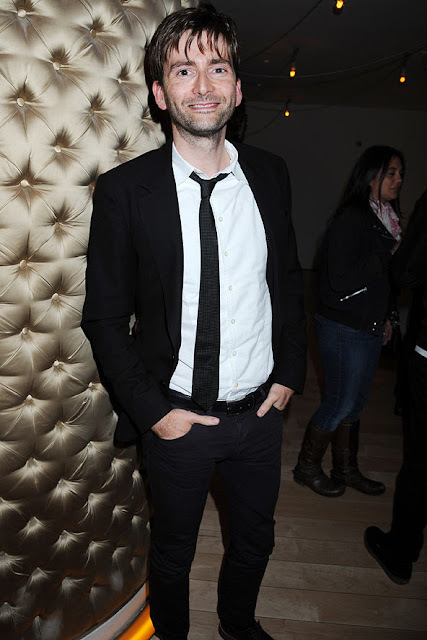 Today's Throwback Thursday looks back to October 2011 when Beatles fan David Tennant was among many stars attending the press night for Backbeat and the after party at Asia de Cuba. The stage adaptation of the 1994 told the story of The Beatles' time in Hamburg and focused on the relationship between John Lennon and Stuart Sutcliffe and Sutcliffe's love for photographer Astrid Kircherr. Nick Blood played Sutcliffe with Andrew Knott as Lennon with Ruta Gedmintas as Astrid. The four-part documentary The Real History Of Science Fiction will be repeated early tomorrow morning on WOWOW Live in Japan. The series originally aired on BBC America and features a host of actors, writers, directors and other creatives representing some of the biggest sci-fi franchises and titles ever created. 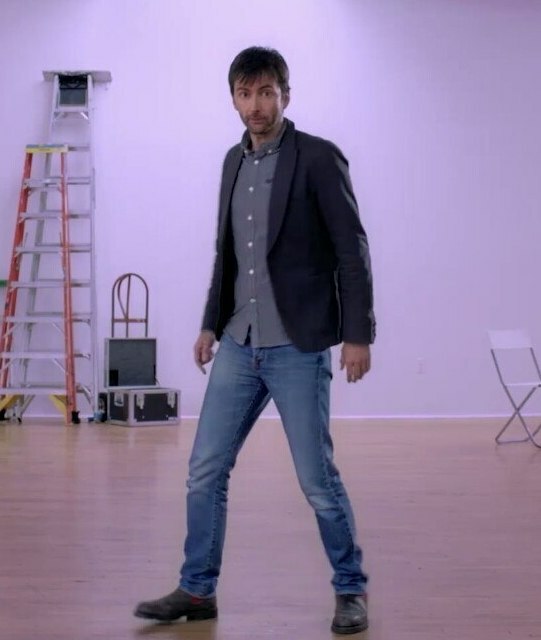 David Tennant contributes to two episodes, on Alien Encounters and Time Travel. Other guests include Steven Moffat, Karen Gillan, William Shatner, Rutger Hauer and Nichelle Nichols. The series will also be repeated on the 5th and 12th July, also on WOWOW Live. The role of the Doctor in Doctor Who has made it into the top 10 greatest television characters of all time, in a poll carried out by Empire. 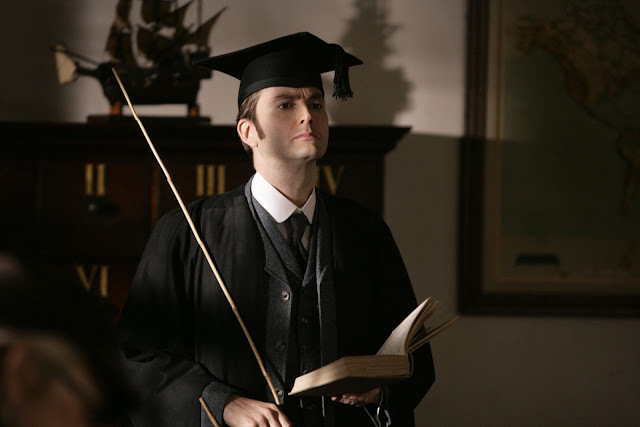 David Tennant played the iconic role from 2005- 2010. Peter Capaldi is currently cast as the Time Lord. Also included in the results were Walter White of Breaking Bad, Game Of Thrones hero Tyrion Lannister, played by Peter Dinklage, cartoon character Homer Simpson and Benedict Cumberbatch’s incarnation of Sherlock Holmes. The twelfth edition of the official comic book series of new Tenth Doctor adventures is scheduled for release today (Wednesday 24th June) in print and digital formats. 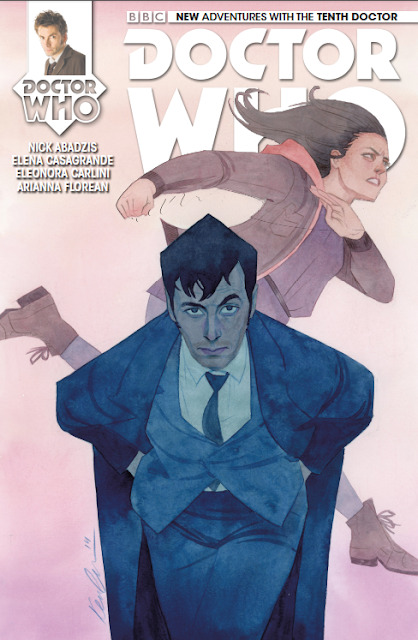 The series by Titan Comics follows the Tenth Doctor, as played onscreen by David Tennant, and his new companion Gabby Gonzalez in the period directly following the climax of the season 4 episode Journey's End. UK: The Essential Doctor Who: Monsters Out Now! UK COMPETITION: Win Gracepoint On DVD!